Erin is a girl after my own heart- she loves to wander bookstores and also adores all things bookish, as I do! She has two fabulous Etsy shops: Hesed Books and Gifts and Bookish Charm. Erin is very generously offering a Haute Whimsy reader (because we do so love readers!) a necklace of their choosing from Bookish Charm. You may choose whichever necklace that your heart desires, but the above charms would be contenders if I were the winner! For a chance to win, please visit Bookish Charm and leave a comment below letting us know which charms are your favorites. *Congratulations to our lucky winner, Tracy! Oh my goodness, there are so many charms I love! These are just a few of my favorites, so much fun! Following Haute Whimsy with gfc. Ooh, love these! I think I'd pick the Your Quote Here charm, and go with a quote from The Great Gatsby. Shakespeare Words of Wisdom "Love All, Trust a Few, Do Wrong to None. I follow Haute Whimsy via email. I "Like" Haute Whimsy on Facebook. How cute! I love lots of these- I think "Shiny" is my favorite! I like "Not all who follow are lost" and Winter is Coming..."
My favorite is "not all who wander are lost"
I love the Tale of Two Cities quote necklace. I like the one that says "Not all who wonder are lost..." and the one that say "Whatever our souls are made of his and mine are the same"
I love the Elegant "Peace, Love, Books" Literary Book Lover Necklace. I am drawn to all the meloncholy Shakespeare quotes esp from McBeth. Must be the mood I am in. When I was young and full of passion I loved Jane Eyre. Have added BookishCharm to my favourites. I like "I am no bird and no net ensnares me; I am a free human being with an independent will." - Romantic Twilight Necklace With Quote "And so the lion fell in love with the lamb"
Liked Bookish Charm on Facebook! I follow Bookish Charm on Twitter as @valentina__z! Liked Haute Whimsy on Facebook! I looove the Mischief Managed necklace....soo dreamy! I love the Marauder's Map Inspired " Harry Potter Pendant Necklace and the Edward Bulwer-Lytton Writer Quote Writing Necklace! Yay, I LOVE Lord of the Rings! This one is my favorite: Lord of the Rings Necklace with Inspirational Quote "All we have to decide is what to do with the time that is given to us". I follow Haute Whimsy RSS! Love them all but really love the hand stamped READ one! 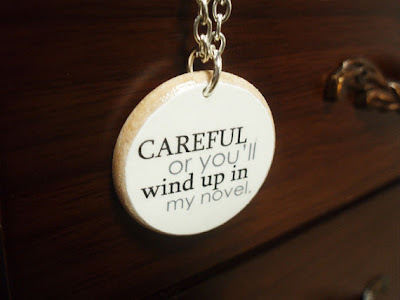 Liked Bookish Charm on FB! Following Bookish Charm on Twitter! Following Haute Whimsy on Twitter! Liked Haute Whimsy on FB! I love the Inkwell Writer Necklace with Black Ink and Real Feather or "Geek" charm. 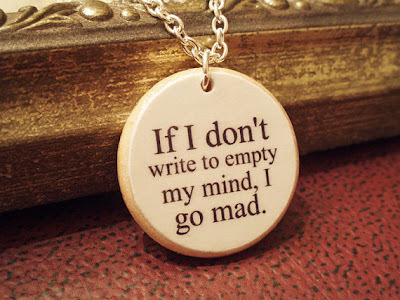 I love the Lord Byron "If I Don't Write to Empty My Mind I Go Mad" Literary Writer Quote Writing Necklace! I like the "I am simply a book drunkard"
I follow Bookish Charm on Twitter. I love the "Geek" and the modern "Know" but they are all really fun and terrific. I almost wish I were a librarian so I could wear the "librarian" charm. My favorite charm is the Marauder's Map Inspired "Mischief Managed" Deathly Hallows Harry Potter Necklace. I like the one "if I don't write to empty my mind I'll go mad, for my daughter has a degree in ENglish. I have posted my favorites on my blog to share with the giveaway post. I liked The inkwell necklace with the black ink and white feather; the L.M. Montgomery quote, Carpe Diem, and a few others. There are so many neat or funny ones. I think that in the end, I might choose the "Your Quote Here" one, just for the challenge of coming up with something different and original. such a neat giveaway. Thank you so much. I like the C. S. Lewis "You can't get a cup of tea big enough or a book long enough to suit me", the "Book Lover", "Eat Sleep Read" "Libris"... I can't decide! i love the Deathly Hallows Inspired Lightning Bolt Harry Potter Pendant Necklace, the Wooden Hand Stamped "Geek" Necklace in Typewriter Font, and the Inkwell Writer Necklace with Red Ink and Real Feather <3 I hope i win! i'm following haute whimsy via gfc! My favourite charm is the Alice in Wonderland Modern Mini Wooden Book Necklace. i liked haute whimsy on facebook! So many great necklaces. I'm tempted by the "I solemnly swear I am up to no good" - Harry Potter nut that I am, but the "Read" necklace is also just too perfect! My favorite charms are "carpe diem" and "libris"! favorite is 'peace love books' -- all the way. I love the lord of the rings and harry potter quote charms best!! I added bookish charm to my etsy favorites! My favorite: "To thine own self be true.." a mantra of mine, persay..
also favorited Bookish Charms on Etsy! 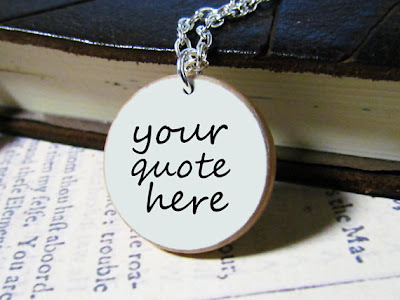 My favorite have to be the Personalized Custom Quote Necklace With Customized Text and Font. 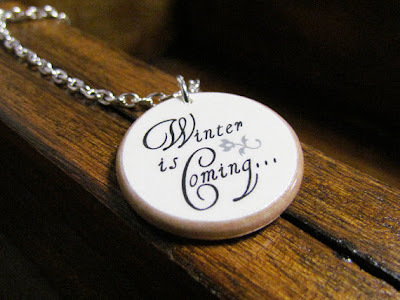 I would choose to put a food related quote on the pendant. I love food,baking,cooking and I have a baking blog.So it fit so well. Maybe I put "True Foodie" on the pendant. Liked Bookish Charm on Facebook under Berendina Dykema. 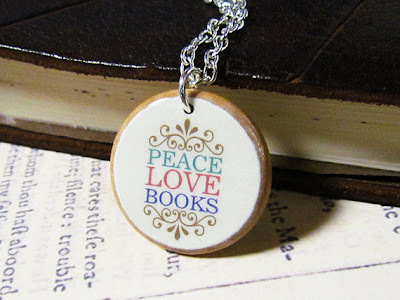 Favorited Bookish Charm on Etsy under berendina Dykema. Following Haute Whimsy via Google Friend Connect under Berendina Dykema. Following Haute Whimsy on Twitter. Liked Haute Whimsy on Facebook under Berendina Dykema. Follow bookish on Twitter - dspdavey. Follow hautewhimsy on Twitter - dspdavey. cause I am such a huge fan of Jane eyre! I like "not all who wander are lost" and thw Wuthering heights quote about our souls being the same. I like the pick your own quote - then I can have something personal, something that inspired me - maybe even a little Banjo Patterson. But if I am so lucky to win, I'll definitely choose a customed one. With my favorite quote from Grey's Anatomy (however lame may that sound): "Drink it in. Because this is it. And it may all be gone tomorrow". I added the shop to my favorites on etsy (as Nilai).